Hanji Naty (한지나티): A New Hanji Festival... outside of Korea! A New Hanji Festival... outside of Korea! I was thrilled to discover, thanks to my dear friend and fellow artist Jan Coveney from Hanji Happenings, that a brand-new Korean Hanji paper Festival has been organized in her beautiful homeland : Australia! 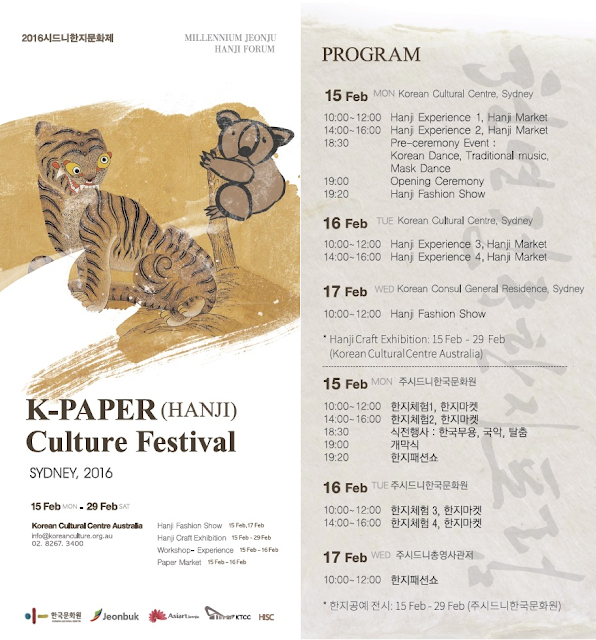 Organized by the Korean Cultural Center in Sydney, the K-Paper (Hanji) Culture Festival will be held from February 15 to February 29, 2016 at the Korean Cultural Center Australia. The program of this 2-week festival includes workshops, an exhibition, a market, and a fashion show. It is very exciting that Hanji is being promoted overseas, and that consequently more and more craft and art lovers will discover the beauties of this material, along with the endless possibilities it offers.